The A minor pentatonic scale is probably the most-used, most-heard, most-seen, and most-demonstrated scale in the rock guitar world. Video instructors use it constantly as the launching point for demonstrating all kinds of pentatonic scale ideas. A minor is a common key, and everyone’s favorite position for playing it sits nicely between frets 5 and 8. Minor pentatonic scales show up everywhere in rock music. Top classic songs from bands like Pink Floyd, Rolling Stones, Led Zeppelin, AC/DC, Aerosmith, Van Halen, Guns N’ Roses, Nirvana, and Foo Fighters feature minor pentatonic scales again and again. In the same manner that learning to write helps you read and learning to read helps you speak, learning the minor pentatonic scale will help you learn, memorize, and master material from all over the rock genre. New riffs, licks, and solos that you learn will be far easier to conceptualize and digest if you can see where they’re coming from. On top of that, when you want to improvise or compose your own riffs, licks, or complete songs, the minor pentatonic scale is a great starting point. I’ll give a few examples from just one band: Led Zeppelin. During my days with San Diego’s Zep tribute band, Dazed and Confused, I became very familiar with these tunes (among many others). Each of these makes heavy use, in both the riffs and solos, of not just any minor pentatonic scale, but specifically A minor pentatonic. And that’s just what I got off the top of my head. I’ll get on with it and present the A minor pentatonic scale in all its boxy glory. Circled notes are the roots: A in three different octaves. The first thing you’ll want to do with the scale is memorize it. The following bit of tablature takes you through the scale diagram above, from the bottom note to the top and back down again. Follow either the tablature or the diagram as you play, whichever is easier for you. To memorize the scale, simply play up and down as above, over and over. Slowly. Try to minimize mistakes. Once you start to feel confident, start weaning yourself off the diagram/tablature. Keep it handy so you can glance at it if you need to. Soon you won’t need it at all. Once you have the whole scale shape memorized, test yourself by starting at a random note somewhere in the middle. Try this with each note in the scale, sometimes proceeding up the scale, sometimes down the scale. One of the great long-term advantages to knowing your pentatonic scales is in improvisation. You’ll find that one pentatonic scale will frequently work well over a whole song. And it’s never too early to start! Play your open A string, let it ring out, and play through parts of the scale slowly, listening to each note. Try stringing adjacent notes together to create melodies. Try skipping notes, different rhythms, just play around with it. See what you can discover. Now is when you unlock 80% of the killer rock riffs and licks you’ve ever heard. 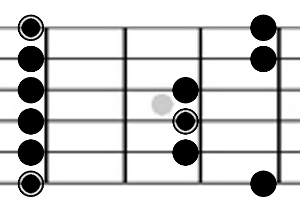 Note the location of the lowest root note in the A minor pentatonic diagram above: 5th fret, 6th string. That note is an A. To play scale on a different root, say G minor pentatonic, you only need to find G on the 6th string. If you’ve managed to memorize a bit of the fretboard, you’ll know to find it at the 3rd fret. Now move the entire scale shape, which was originally anchored at the 5th fret, down to the 3rd fret. If you’re after D minor pentatonic instead, move the whole shape up to the 10th fret, where you’ll find the root D on the 6th string. You’ve now unlocked thousands more songs in all 12 keys. Take a look through the songs you already know how to play, and see if you can find some of these scale patterns. And next time you’re learning a new song, if you see a few notes that look like they’re coming out of this minor pentatonic scale shape, chances are good that you can use that shape for improvising, memorizing, and figuring out how to play the rest of the song on your own.